You're bombarded with promises that, if you try the Pilates Reformer, you'll miraculously lose pounds, lengthen your muscles and become a celebrity look alike. While the Reformer can truly be a transformational exercise program, it doesn't work in the way you might think. 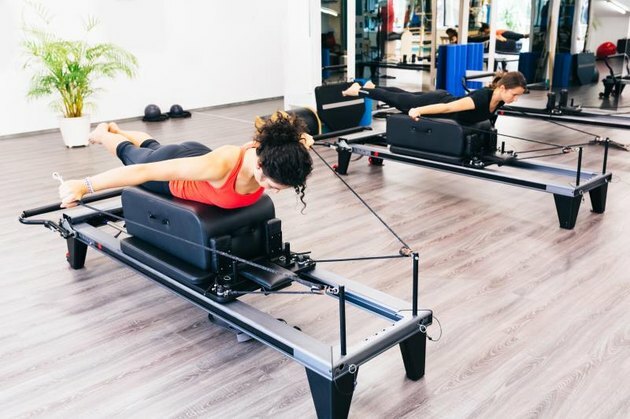 Reformer sessions can be a part of a comprehensive strategy to lose weight, and the Reformer might even change the way your body looks, but don't expect the Reformer alone to be your only ticket to changing numbers on the scale. Weight loss is a result of creating a calorie deficit. You eat fewer calories than you burn and you drop pounds. Now in some cases, hormones and other metabolic factors come into play, but the primary driver of weight loss is calories in versus calories out. Pilates Reformer can help you burn calories, but not as much as certain other activities. And, like any movement, how many calories you do burn depends on how long your session lasts, the intensity of the session, your ability (if it's new for you, you're likely to work harder and burn more calories) and your size. Not a lot of research has been done specifically on calories burned during Pilates Reformer workouts as so many variables come into play. However, 2005 research presented by the IDEA Health and Fitness Association suggested a person burns an average of 4 calories per minute for a beginner class, and 6 to 8 calories per minute in an intermediate or advanced class. These measures were calculated according to a mat class, but you can estimate about the same for a Reformer. This means in an hour, expect to burn between 240 and 480 calories. To lose a pound requires you burn 3,500 calories more than you take in, so with Reformer alone, you'd need to work seriously and intensely most days of the week to see notable weight loss. Instead of relying on the Pilates Reformer as your sole source of exercise, include it as part of your total plan. Reformer has great value in retraining the way your muscles work. You'll undo imbalances, strengthen your back and develop a solid core. Proper execution of exercises on the Reformer takes time to learn, however, and requires a progression. You'll need to start with basic exercises to hone proper form, and these burn fewer calories. Start with a program that has you on the Reformer two to three times per week to develop this awareness and avoid burnout. Over time, you can build up the near daily workouts. Because Reformer work is best done under the guidance of a certified Pilates professional, she can tell you when you're ready to add workouts and progress to more advanced movements. On days you don't do Reformer, consider other exercise to burn calories and see results. Speed walking, jogging, elliptical training and dance are all ways to vary your workout, burn more calories and get weight-loss results. And, while the Reformer does provide some strength work — especially when you get into immediate and advanced work that uses pulleys and springs — you'd benefit from a couple of days of other resistance exercise per week. Squats, push-ups, rows, triceps dips, curls and shoulder presses augment the benefits you get from Pilates Reformer. This also accelerates the process through which you build lean muscle, which raises your metabolism so you burn more calories all day long. Even if you don't lose weight with the Reformer, you may notice changes in the way you look and move. The Reformer helps increase flexibility in your joints so you find fuller range of motion when you walk and sit. Your posture looks taller and as a result, you appear more confident, toned and fit. Reformer can be a way to to lose weight, but alone, it's not the most efficient way. Use it as part of a total-body weight loss program. For the best results, you'll also want to change your diet to include only moderate portion sizes and contain mostly whole, unprocessed foods such as lean meats, white-meat chicken, fish, fresh green vegetables, whole grains and fresh fruit. If you've got a lot of weight to lose and live a sedentary lifestyle, the Reformer may bring results more quickly than it will for someone who's looking to drop those last few pounds. This is because a larger person will burn more calories during a session. Plus, any movement starts the process of weight loss when you haven't been doing much of anything. As you get closer to your goal weight and exercise regularly, it's harder to lose those pounds.